Here is a 16ft outrigger canoe that I became aware of in July 2013. Boat is manufactured in Florida. More information can be found here LINK. 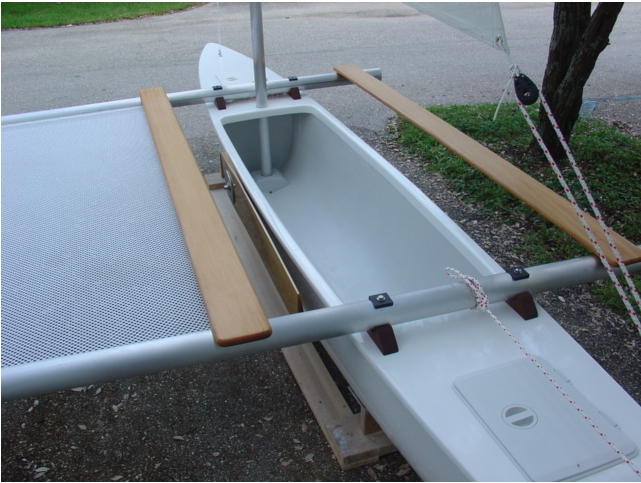 BELL COMPOSITES would like to introduce our new PACIFIC 16' OUTRIGGER CANOE Can't go to Samoa? Bring a little of the South Pacific to you. We have based our new Sailing Outrigger on the classic Samoan Canoes. The Pacific Islanders have perfected this design over of hundreds of years we just added the modern aerospace composites element. This timeless beauty does it all very well... Paddle, Sail or even Surf a wave. 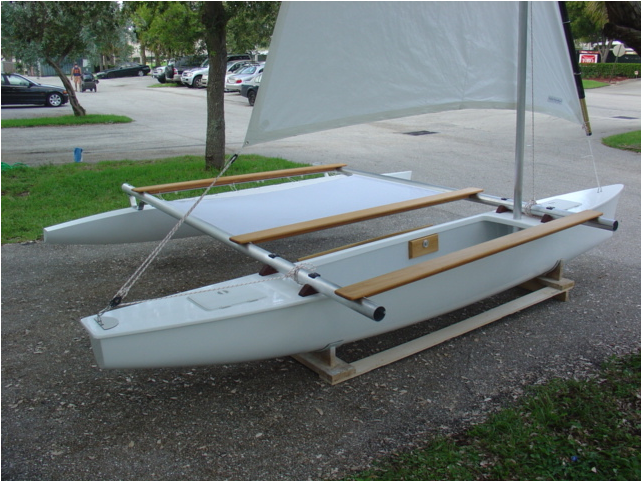 The outrigger with a wide beam makes a very stable boat to have family fun on. If you would rather Motor than Sail no problem, an optional Electric Motor or Gasoline Outboard under 5HP is all you need. We have also added a large 7' x 7' Trampoline for surf gear or sun bathers that is big enough for a 3 person tent. Camping? The open center section of the main hull is for better seating and room for your large ice chest. The bow and stern sections of the main hull are sealed with watertight bulkheads and weatherproof hatches for dry storage for your gear. The outrigger hull "Ama" is also sealed with inspection ports and foam floatation. 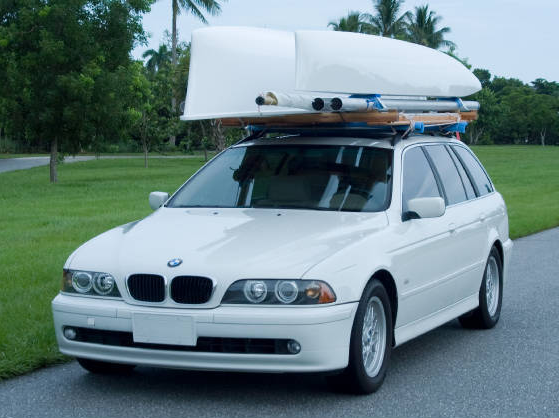 Easy to transprt and set up...we car top it...no trailer needed and even better no boat ramps...Yippee. Fun for the whole family with a normal payload of 600 pounds. Super strong and durable aerospace construction. Alumium crossbeams and Carbon Fiber Hardware. 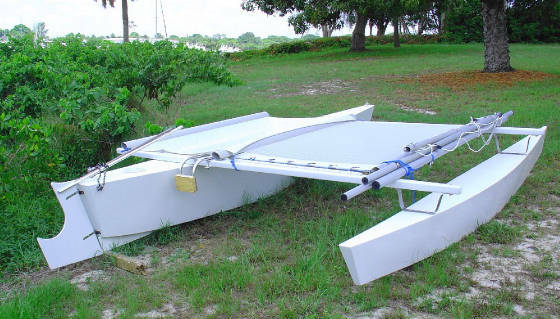 Easy to set up and take down for transport , less than 200 pounds total weight and less than 45 minutes set up to sail or power off the beach. Three versions in one Paddle, Sail or Power with Optional Outboard. 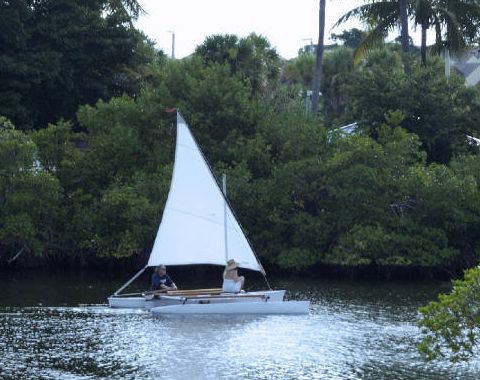 Easy to Sail with classic Lateen rig.. with no boom to boom you that is standard. 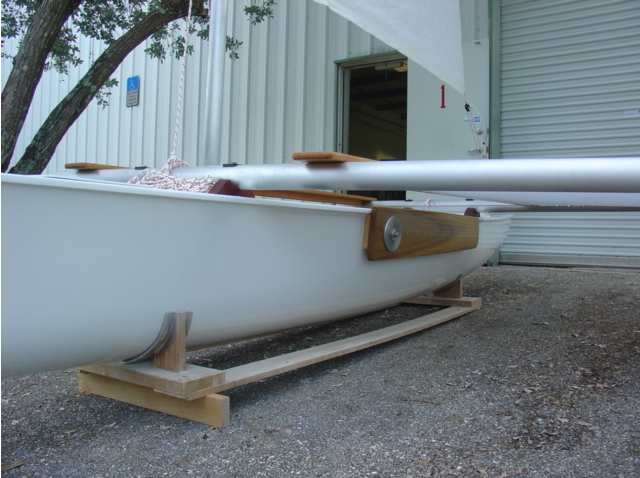 Pivoting NACA section Leeboard and Kick up Rudder to make shallow water sailing and beaching easier. Offshore Cats is a 29 year old Palm Beach County Florida Boat Building Company that strives to use all USA made products.